The new Stereo VideoMic Pro provides a high quality stereo option for videographers, and is ideal for recording music, and the atmospheric ambience essential in building a realistic audio scene. Based around the all new capsule with its matched pair of high sensitivity 1/2 in. cardioid condensers in a coincident XY pair, the Stereo VideoMic Pro provides a wide stereo image with natural depth. Another new addition is the integrated Rycote® Lyre® based shock mounting system, which separates the Stereo VideoMic Pro capsule and electronics from its mount, providing isolation from external physical factors that may cause unwanted rumble and vibrations in the microphone. Constructed from a single piece of hard-wearing thermoplastic, the Lyre® provides superior acoustic suspension to traditional elastic solutions, and will never wear out, sag or snap. The Stereo VideoMic Pro, with its ergonomic form factor, make it perfectly suited to DSLR, consumer camcorders and large-sensor video cameras. The newly designed Kevlar reinforced braided cable, as well as the improved foam windscreen, provides excellent acoustic decoupling from the camera and offers significantly lower noise transference and higher sensitivity. The user friendly designed rear of the microphone body features the power and equalization controls, including a high pass filter at 75Hz which is designed to cut out the noise generated by air conditioning, traffic and other undesirable low frequency interference. A -10dB Pad allows the user to reduce the sensitivity of the microphone, making it suitable for recording loud sound sources such as live music or at sporting events. Like the VideoMic Pro, the Stereo VideoMic Pro features a +20dB level boost specifically designed to provide a higher quality signal with DSLR cameras. When activated, the typically low quality camera preamp level can be reduced, resulting in a lower noise floor and much clearer recording. 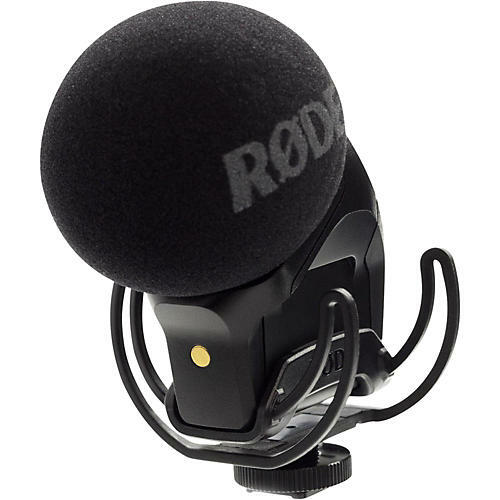 The RØDE Stereo VideoMic Pro is designed and made in Australia, and covered by RØDE Microphones' industry leading 10 year warranty.